The second entry from BBC Baghdad correspondent Andrew North, in his regular column about his experiences in one of the toughest reporting assignments in journalism. He will be sending fortnightly entries reflecting daily life for him and ordinary citizens in the embattled Iraqi capital. We are in a dimly-lit auditorium at an American military base north of Baghdad, in Salahuddin province. Somewhere nearby is Tikrit - Saddam Hussein's home city. We could be anywhere though - one US base looks like the next - and we won't be going beyond the perimeter on the visit. This is one of the more dangerous parts of Iraq right now. The US ambassador to Iraq, Zalmay Khalilzad, is speaking. He's here to open what's known as a "Provincial Reconstruction Team" or PRT - an enterprise aimed at boosting the local government. Some might say it is little more than PR and wishful thinking, given the dreadful security situation. But that's what this is all about. Doing things like getting local courts going and fixing up sewers and power will help calm things down - so the thinking goes. And as US President George W Bush hunts for new ideas for Iraq, smaller, hearts and minds-style initiatives may become more important. Mr Khalilzad is an old hand at events like this. Promises of millions of dollars are mixed with admissions "that mistakes have been made". He's a charismatic figure and provokes laughter by repeatedly correcting one of the translators - but shows a practised touch by going to her afterwards to thank her for her efforts. But something is missing. All this talk about rebuilding Iraq, but where is Iraq? Not here on this American base. Most of his audience are US soldiers. Only the governor and a few other local Salahuddin officials have been brought in for the occasion. As I listen, I realise the first time I ever saw Mr Khalilzad in person was at another PRT opening - in Afghanistan almost three years ago, when he was the US ambassador there. For it was there, on his watch, that these institutions were born. Their record in Afghanistan is mixed. But in more secure areas, PRTs have had some success - where the teams of soldiers and civilian experts can engage with local people and officials more easily. However, buried behind layers of security on this base, as this Salahuddin operation is likely to be, it is doubtful that local Iraqis will even know it exists. That Afghan PRT inauguration was in a small town called Asadabad, not far from the Pakistani border. 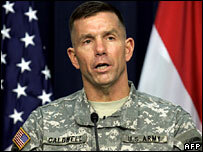 It is a difficult area, where Taliban and al-Qaeda influence remains strong, so security was a concern there too. 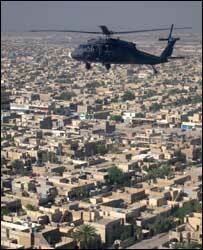 As with our trip from Baghdad, Apache gunships escorted our helicopter armada over the mountains from Kabul. But in Asadabad that day, there was still a sense this was for and about Afghanistan. A troupe of dancers performed at the front. A group of women in blue burkhas sat at the back. Even if they had been selected, local people were in the audience. Children played oblivious in the nearby trees. 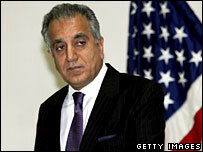 Mr Khalilzad, who is Afghan by birth, was in ebullient form as he addressed the gathering in their native tongue. The local governor's response was enthusiastic, promising the US ambassador a piece of land. Are US soldiers losing faith in new initiatives in Iraq? It was though, a very different time - in Afghanistan as well as Iraq. There was more hope around then. At this US base somewhere near Tikrit, the mood seems sombre and resigned. Many of the recent US casualties have been among troops based in this area. The sense from the soldiers is of going through the motions, rather than believing yet another initiative will make any difference. A news conference with the governor afterwards is cut short when one of the ambassador's staff interrupts to say a storm is gathering. We have to leave before approaching dust clouds envelop the base and ground the helicopters. Will this PRT help Salahuddin, I ask the governor as everyone rushes for the door. No-one wants to get stuck here. He smiles thinly. "We will see. Inshallah [if God wills it]." I am writing this on the terrace at the back of the BBC office, looking down at our small square of garden. It is late afternoon and a rich yellow light bathes the palm trees. For once, our huge, sarcophagus-like generators are silent - one of those rare moments in the day when we have power. When they are running, which is most of the time, the noise is terrible. 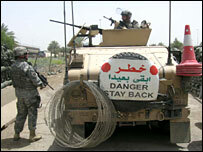 Without them though, there would be no BBC in Baghdad. Sometimes we set up a table tennis table in the garden and play doubles - mainly to give us foreigners a chance, because most of our Iraqi staff seem to have played for the national team before they worked here. At the moment, we have got a volleyball net up, although no-one has played in a while. But our little sanctuary ends at the high wall round the garden, decorated with barbed wire. And the generators at peace means I hear the sounds of Baghdad three-and-a-half years on from the US and British invasion. There's been a fairly constant crackle of gunfire all day - a kind of running commentary on the capital's slide into madness. Trigger-happy security men barging through the streets in blacked-out 4x4s cause most of the shooting. Traffic control, Baghdad style. If you are on the road when one of these moving maelstroms appears, you get out of the way fast and hang back till they have gone. There were several big thumping bangs during the day, one a few streets away. A cloud was soon rising above the rooftops. 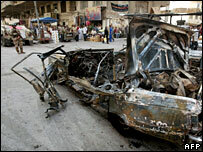 It was a car bomb - five people were killed. But such incidents now become another statistic within hours, so quickly are they superseded. For those of us who work here it sounded like any other day. Yet after this recent surge in violence during Ramadan, there is a palpable mood change among many Iraqis I've talked to and a fear that things are on an unstoppable downwards slope. More people are thinking of ways of leaving. It is now more than four months since Prime Minister Nouri Maliki's government was finally formed, the day after the al-Qaeda kingpin Abu Musab al-Zarqawi was killed. No-one expected things would suddenly change then, but they did not expect they would get dramatically worse. President Bush's acknowledgement of a parallel with Vietnam and the Tet offensive got most of the headlines in the past week. But it was the drawn, worn-out look of the normally upbeat US military spokesman, Major General William Caldwell, which caught the attention of many here - as he admitted the American plan for securing Baghdad had failed. He didn't say failed, of course. The words were "disheartening" and "has not met our overall expectations". But his face did, with a weary expression that seemed to say "we've run out of options".